Kuala Lumpur, March 2017 – Heads up, Kpop fans! 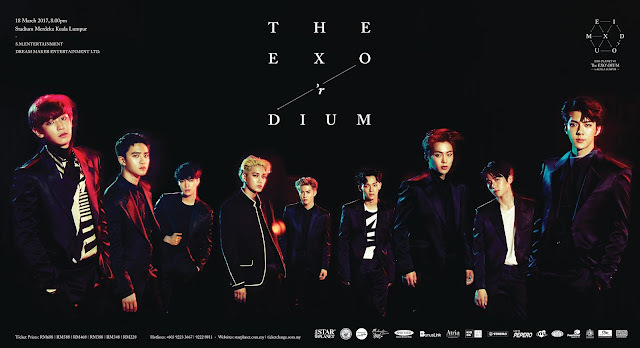 Korean boy band EXO will be back to Kuala Lumpur with their #3 World Tour “The EXO’rDIUM” on March 18th, 2017 at the Stadium Merdeka. The ticket sale crossed the 10-thousand threshold with over 14,000 tickets sold to date and ticket sale is still moving fast! The nine EXO members recently recorded an exclusive video which went viral on the internet, garnering over 330,000 FB video views in mere 3 days. The group’s popularity continues to rise reported several major music awards won under their belt. Organized by Star Planet, supported by Malaysia Major Events, the 2-million Ringgit stage production will begin setup at the Stadium Merdeka this Sunday. Tickets are priced at RM688 (Rock), RM588 (CAT 1), RM468 (CAT 2), RM388 (CAT 3), RM348 (CAT 4) and RM228 (CAT 5) *subject to RM4 processing fee. EXO officially kicked off their brand new tour “EXO PLANET #3 The EXO’rDIUM” with six dates in Seoul, setting a new record as the first K-pop group in history to have the longest solo concert ever run, at Seoul’s Olympic Gymnastics Arena, with over 84,000 spectators. The tour has reached major cities including Bangkok, Hong Kong, Taipei. For more information, please log on to www.starplanet.com.my / www.ticketcharge.com.my or call hotline 03-9223 3667 / 9222 8811.